Good news for BMV users who use Roboform. This toolbar did not show the correct BMV text colours next to it's icons...something of a blasphamy I thought! ...but it gets worse, the Roboform text colours seemed not able to be overwritten by either the OS theme or my userChrome.css snippett that I wrote for one of my users. Infamy! So..only one thing for it...Roboform would obviously have to be rewritten to work with BMV...and so it was, by the guy who first made it, so I'm told...and now works correctly. Well, what to say about Metal Lion - Blue Moonlight Vista? The Firefox 3 version looks pretty sharp and has been improved a bit. Changes that I think you'll like. I'm going to play around with the idea of the Stop/Reload/Bookmarks toolbar buttons matching the others, we'll see how it looks after a few mockups and then I'll decide if I want that look. As for the rest, there is a lot of stuff I cannot go into. All I will say is that for 'Frank Lion' (this will amaze some, but that's not my real name, haha) for BMV and all the rest of my themes, 2008 is a 'special' year. Waiting with baited breath... Since upgrading to Hardy, with Firefox 3, the Theme Cupboard has been a bit bare. steviex wrote: Waiting with baited breath... Since upgrading to Hardy, with Firefox 3, the Theme Cupboard has been a bit bare. Well, will not be long now. Been a couple of changes to BMV for FF3, like ...'it's better' type stuff. If anyone would like to see a sneak preview shot, then let me know. BTW In Firefox 2 many themes were using 3 part tabs (left/centre/right images for each tab) All the themes I've noticed for Firefox 3 now seem to be using single part tabs, the same as the default theme. Anyone know why? Frank Lion wrote: BTW In Firefox 2 many themes were using 3 part tabs (left/centre/right images for each tab) All the themes I've noticed for Firefox 3 now seem to be using single part tabs, the same as the default theme. Anyone know why? Maybe because FF 3.0 has better rounded borders? Don't know... Or to benefit from APNG? I still using the three part approach, but using one single image for all tabs (active and inactive). Don't give a man a fish. Teach him how to fish instead. Frank Lion wrote: If anyone would like to see a sneak preview shot, then let me know. Oooooh I do, I do! Like steviex, I can't wait; I been using Fx3 for a couple of hours now and I'm already showing signs of Quality Theme Deprivation Syndrome. Fancy tabs retained, star and Go outside the boxes (not easy stuff) and new shaded url/searchbars. Will not be released just yet, the 'donationware' side has now finished, there will be will be 'limited distribution' on this and any 'donators' will be ensured of going straight to the top of the list, when it's released. Now that I host my own stuff, things will be different. All look good enough and sound fair enough? ^ Hmmm :drool: nice! Nailed the search-bar too eh? Me wants it! Mr.Lion wrote: All look good enough and sound fair enough? BTW - Anyone hear anything about a Fx3 compatible version of the POTO Sidebar Extension? Great job, Frank! I look forward to prying open my (barren) wallet and giving this one a shot. Awesome work, as always. Truly inspirational! Cato62 wrote: Great job, Frank! I look forward to prying open my (barren) wallet and giving this one a shot. Frank Lion wrote: Will not be released just yet, the 'donationware' side has now finished, there will be will be 'limited distribution' on this and any 'donators' will be ensured of going straight to the top of the list, when it's released. I did the right thing and gave up a couple greasy burgers to donate for Blue Moonlight a long time ago. I just upgraded to Firefox 3.0, and already miss it. Is it "for sure" that you will do a version 3-compatible release? Can I get on a list for notification when it is available? And do I need to give up a couple more burgers to get the new one? I think I have already covered your other questions in the posts above. Hi Frank, I was using this for FF2, in my opinion it was the best theme created for FF2. I was just wondering if there was an ETA on the FF3 version of the theme. Without the theme, to be honest, FF looks a bit blanned, so, any answer would really suffice. Just wondering when FF3 users would be able to use this great theme once again. 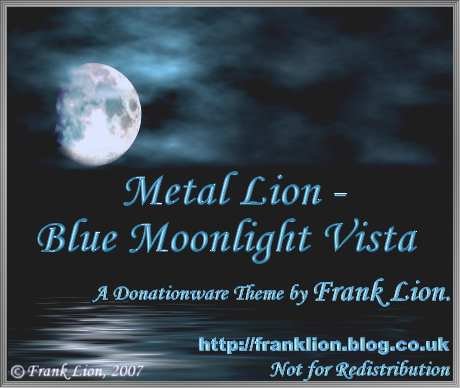 Metal Lion - Blue Moonlight Vista is my favorite theme, too. Any word yet on when the FF3 version of the theme will be released? My friends told me about this theme but unfortunately I find that it is not available anymore. Is there any chance of a revival if we say please?